Implant supported dentures are preferred by many Middletown, NJ dental patients who are missing all of their teeth but want a more stable prosthetic replacement option than traditional dentures provide. Unlike regular dentures, which rest on the gums unsupported, an implant supported denture is anchored in place by titanium rods surgically embedded into the jaw bone. This prevents the dentures from slipping or becoming loose during wear. Many patients find that implant supported dentures in Middletown, NJ provide greater comfort, easier chewing, and better communication capabilities than are available via traditional dentures. There are two types of implant supported dentures – ball retained and bar retained. Ball retained dentures are secured by ‘ball and socket’ joint attachments connected to each individual implant. A bar retained denture uses attachments connected to a bar that runs along the curvature of the jaw bone. This bar is held in place by between 2 and 5 implants, requiring fewer implants overall than ball-retained dentures do. Am I a candidate for implant supported dentures in Middletown, NJ? You may be a candidate for an implant supported denture if you are missing all of your upper or lower teeth and have enough jawbone to support artificial tooth roots. If you don’t have sufficient bone structure, your provider may recommend undergoing a grafting procedure to help build up the jaw in preparation for implants. You’ll need to consult with your dentist to ensure that an implant supported denture is right for you. What should I expect if I undergo an implant procedure? Getting implant supported dentures is a multi-step process that generally requires 2 in-office surgeries performed several months apart. During the first visit, implants will be secured within their designated locations inside the jaw. They will then be left to heal over a period of 6 to 9 months. You may be fitted for temporary dentures to wear during this time. At the conclusion of your waiting period, you’ll return to your provider’s office to have the implants re-exposed and either an abutment or bar secured to them. 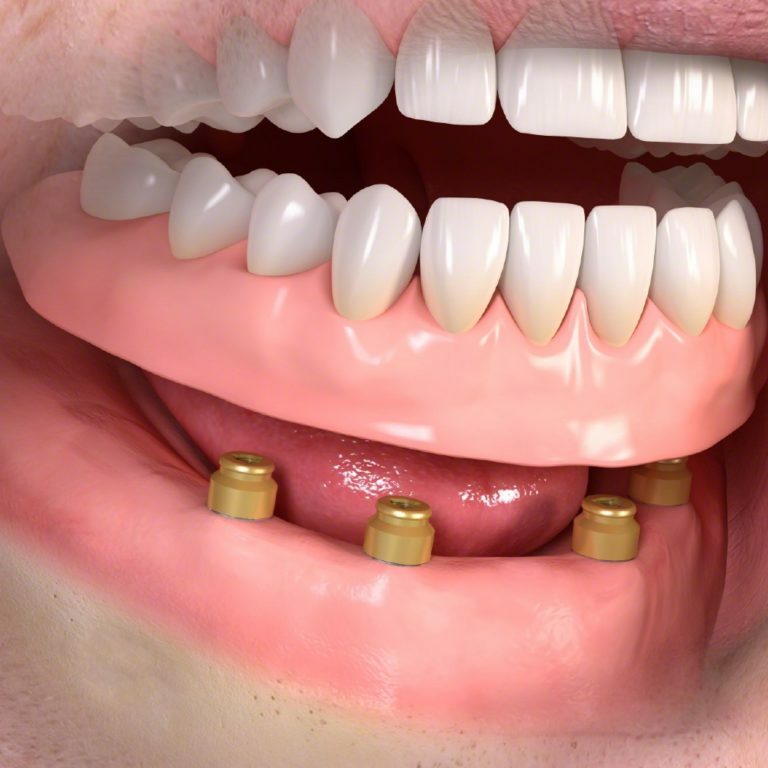 Lastly, you’ll be fitted for your final dentures, which will contain connective hardware for easy attachment. How will I need to care for my implant supported dentures? Although implant-supported dentures are designed to remain in place without slipping, they must be removed each night for cleaning. You’ll also need to carefully brush around each attachment and soak them nightly.